Home » What is Stud Welding? Capacitor Discharge Stud Welding is generally used to weld smaller diameter fasteners to thin base metals. Since the entire weld cycle is completed in milliseconds, welds can be made without pronounced distortion, burn-through or reverse side discoloration. As long as one end of the fastener is designed for CD welding equipment, CD Studs can be manufactured in almost any shape. The fastener is placed against the workpiece. Most CD studs have a special tip which provides precise weld-time control, for consistent, automatic welds. 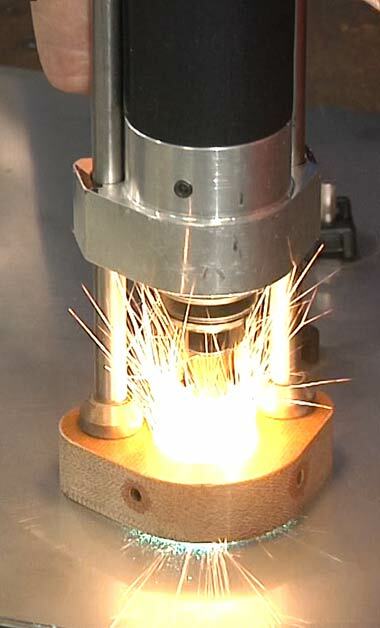 The weld gun is activated and stored energy is discharged through the fastener melting the full diameter of its base and a portion of the parent material. Spring-loading forces the fastener into the molten metal. 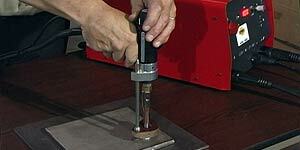 The fastener is held in place as the molten metal solidifies and instantly creates a high quality fusion weld. 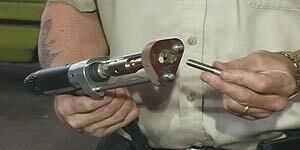 A weld stud fastener is manually or automatically inserted into the stud welder gun. 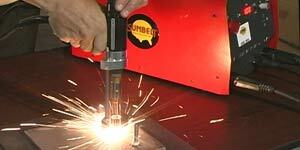 The Stud Welding Gun is positioned into firm contact with the work surface. The stud welding gun is activated and the weld stud fastener is welded in a fraction of a second. The fastener weld develops full strength instantly. Installation of flanged aluminum CD studs with Sunbelt Pro-C 1000, VZB Feeder Bowl and PHM-500 Lift / Gap Stud Welding Gun, for rapid, high quality welds. PLATING Cadmium to ASTM-A165 type TS, zinc to ASTM-B 633 (formerly A 164) and other platings are available. Non-weldable plating is removed from the weld end to avoid contamination of the weld Copper plating is standard. Cadmium, Nickel, Zinc and other platings are available. ANNEALING Low carbon steel can be annealed to a maximum of 75 Rockwell B and stainless steel to a maximum of 90 Rockwell B. All low carbon steel and stainless steel studs are annealed where required. THREADS UNC-2A is standard for external threads prior to plating and UNC-2B for internal threads. Metric and other thread sizes are available. UNC-2A is standard for external threads prior to plating and UNC-2B for internal threads. Metric and other thread sizes are available. WELD BASE 1/4" dia. and over have solid flux. Diameters under 1/4'are standard pointed, and flux is optional. Flanged, small flanged, and nonflanged are available. STUD LENGTH SUNBELT arc stud length designations are BEFORE WELD. AFTER WELD lengths are shown in the table below. CD studs have no appreciable length reduction after welding. FERRULES All orders include ferrules when they are required. Does not apply to CD.